Transcript of BriefingsDirect podcast with Hewlett-Packard's John Bennett on virtualization and its role in the enterprise. Virtualization in information technology (IT) has become a very hot topic in the last several years, and we're approaching a tipping point in the market, where virtualization's adoption and acceptance is really rampant, and it's offering some significant benefits in terms of cost and performance. So, we're going to talk about rethinking multiple tiers of virtualization for applications, infrastructure, desktop, and even some other types of uses. We're also going to look at this through the lens of a contextual approach to virtualization, not simply a tactical standalone benefit, but in the context of larger IT transformation activities. These include application modernization, data center consolidation, next generation datacenter (NGDC) architectures, energy considerations, and of course, trying to reduce the total cost of IT as a percent of revenues for large organizations. To help us sort through these issues of context and strategy for virtualization, as well as to look at a number of initiatives that Hewlett-Packard (HP) is now embarking upon, we're joined by John Bennett. John is the worldwide director of data center transformation solutions, and also the HP's Technology Solutions Group (TSG) lead for virtualization. Welcome to the show, John. John Bennett: Thank you very much, Dana. It's a pleasure to be with you today. Gardner: When we talk about virtualization as a red-hot trend, just how big a deal is virtualization in the IT market right now? Bennett: Virtualization is certainly one of the major technology-oriented trends that we see in the industry right now, although I'm always reminded that virtualization isn't new. It's been available as a technology going back 30-40 years. We see a great deal of excitement, especially around server virtualization, but it's being extended to many other areas as well. We see large numbers of customers, certainly well over half, who have actively deployed virtualization projects. We seem to be at a tipping point in terms of everyone doing it, wanting to do it, or wanting to do even more. Gardner: Are they doing this on a piecemeal basis, on a tactical basis? Is it being done properly in the methodological framework across the board? What sort of a market trend are we looking at in terms of adoption pattern? Bennett: In terms of adoption patterns, especially for x86 server virtualization, we see virtualization being driven more as tactical or specific types of IT projects. It's not uncommon to see customers starting out, either to just reduce costs, to improve the efficiency in utilization of the assets they have, or using virtualization to address the issues they might have with energy cost, energy capacity or sometimes even space capacity in the data center. But, it's very much focused around IT projects and IT benefits. It's a very interesting evolution of things with increasing value to the business, but it's very much stepwise, and today tends to be focused around IT benefits. We think that's kind of missing the opportunity. Gardner: So we've been on this evolution. As you say, virtual machines, hypervisors, this approach to isolating activity at a level above the actual metal, the binaries, has been around for some time. Why is this catching on now? Is it not just economics, and, if you're talking about a business outcome, why are they important and why is virtualization being applied to them now? Bennett: It really did start with economics, but the real business value to virtualization comes in many other areas that are much more critically important to the business. We also see, as I highlighted earlier, that it really does connect into business continuity, which we see in many of the market research surveys we do year after year. It continues to be a top-of-mind concern for CEOs and CIOs alike. Gardner: Perhaps we're at this point in time where IT has become so essential to so many aspects of how businesses operate -- the ability of making IT dynamic and responsive, of having redundancy and failover and many of the mission critical aspects that we expect of perhaps certain transactional systems -- we're now able to extend almost anything we do with IT, if it's being supported to a virtualized environment. Bennett: Well, it's actually being supported through any environment, and it's why we at HP have such a strong focus on business technology. There are very few modern enterprises, whether they're private or public entities, that really could address their mission and business goals without IT. It is just a completely fundamental fabric of the business today. And, having that environment be responsive, protected, reliable, and delivering quality of service are key attributes of that environment. This is why we see, next-generation data centers and adaptive infrastructure from HP as being key to that, and it's why we speak about the idea of data center transformation. If that's the IT environment you want, including virtualization, how do you get there from wherever you are at? Gardner: I suppose it's also important to point out that we're not just talking about virtualization, but we're also talking about mixtures, where there are going to be plenty of physical infrastructure and technology in place, but increasingly virtualized instances here and there. I suppose it's managing these together that is the most important discussion at this point in time. Bennett: It certainly is one of the more topical points right now. What we see is that customers start to deploy virtualization more broadly, and, as they want to run more and more of their applications in virtualized environments, two challenges arise. One of them is want of diversity. Customers are accustomed to diversity of the infrastructure, but now we have diversity with the virtualization base. The virtual machines that they're using, the number of suppliers involved in it, and diversity brings complexity, and complexity brings increased risk usually. One aspect of that diversity is controlling management. You have different virtual machines, each with their own management tools and paradigms. How do you manage from an applications, quality of service, or service-level agreement point of view, across physical and virtual resources and infrastructure that are being used to deliver those services to the business? And, how do you deal with managing physical infrastructure from different manufacturers, and virtual resources from different manufacturers. Another complication that comes up from a control and management point of view, as customers strive to use virtualization more pervasively in the data center, is that you have to deal with the skill sets of the people you have in the IT organization, as well as the resources available to you to help implement these projects. One of the virtues of looking at virtualization more comprehensively is that you're actually able to free up resources to focus more on business services and business priorities and less on management and maintenance. If you look at virtualization more strategically, you say it's not just the servers, but it's my storage and network environment around them. It's my management tools and processes. It's how I do everything together. When I look at it comprehensively, I not only have a very clean set of controls and procedures in place for running and managing the data center, but now I have the opportunity to start making significant shifts in resources, away from management and maintenance and into business priorities and growth. Gardner: So we are faced with a potential tipping point, but I suppose that also brings about a new level of risk, because you're moving from a tactical implementation into a variety of implementations, at the application, the infrastructure, and the server levels. Increasingly we're seeing interest in desktop virtualization, but we're also seeing a mixture of suppliers and technologies, and we're also seeing this in the context of other initiatives, with the goal being transformation. It seems that if you don't do this all properly with some sort of a framework, or at least a conscious approach of managing this from beginning to end in a lifecycle mentality, there could be some serious pitfalls. You could actually stumble and subvert those benefits that you're looking to enjoy. Bennett: Yes, we see both pitfalls, i.e., problems that arise from not taking a comprehensive approach, and we see missed opportunities, which is probably the bigger loss for an organization. They could see what the potential of virtualization was, but they weren't able to realize it, because their implementation path didn't take into account everything they had to in order to be successful. But, it's always driven from a business perspective -- what is the benefit to the business, both quantitative and qualitative -- and then drilling down. It's like unpeeling an onion, if I can borrow the analogy from the "Shrek" movie. You go from, "Okay, I have this business service. This business service is delivered through virtual and physical resources, which means I need management in control and governance of both physical and virtual resources." And then, underneath that I want to be able to go from insight and control, into management and execution. I want to be able to drill down from the business processes and the business service management and automation tools into the infrastructure management, which in turn drills down into the infrastructure itself. So, part of the onus is on HP in this case to make sure that we're integrating and implementing support for virtualization into all of the components in the data center, so that it works and we can take advantage of it. But, it's up to the customer also to take this business and data center view of virtualization and look at it from an integration point of view. If you do virtualization as point projects, what we've seen is that you end up with management tools and processes that are outside of the domain of the historical investments you've made, whether it's an IT service management in Information Technology Infrastructure Library (ITIL), or in business service management. We see virtual environments that are disconnected from the insight and controls and governance and policy procedures put in for IT. This means that if something happens at a business-services level, you don't quite know how to go about fixing it, because you can't locate it. That's why you really want to take this integrated view from a business-service's point of view, from an infrastructure and infrastructure management point of view, and also in terms of your client architectures. Gardner: Now, as we are rethinking infrastructure, and in the context of virtualization, we also are looking for these business outcomes. Are we at the point yet where the business leaders are saying, "We need virtualization?" Have they connected the dots yet, or do they just know what they want from business outcomes and really don't care whether this virtualization gets there or not? Bennett: From a business leader's point of view, they don't care about virtualization. Whether it's a CEO, a line of business manager, even a CFO their focus is on, "What are the business priorities? What is our strategy for this business or this organization? Are we going to be trying to grow the business organically, grow it through acquisitions, are we going to be driving a lot of product or service innovation? I need an organization that is going to be responsive to rolling those out." And, of course, there is always the pressures to reduce cost and reduce risk that apply throughout the business, including to IT. They will not tell you that virtualization is what you have to do if you're in IT. IT wants to deliver these kinds of benefits, to be able to do things quickly, to be able to dynamically put resources where they're needed, mitigate the risks in the data center environment, whether the risk is related to power and cooling, to the capacity of individual server and its ability to support a particular application, or the risk associated with people and processes that can cause downtime. Those are IT projects, and for IT, virtualization is a fascinating technology, which allows them to address multiple sets of data center issues and provide the benefits that the business is looking for. It's revolutionary in that sense. It's pretty cool. Gardner: This is not another "silver bullet," is it? We're really talking about something that's fundamental and that is transformative. Bennett: Oh, absolutely. We believe that virtualization is a very important attribute of an NGDC. It's been an instrumental part of our adaptive infrastructure, which defines our view of an NGDC for a quite a while, and we see virtualization projects as core to successful transformational initiatives as well. Gardner: Nowadays, and actually for several years, incremental improvements in IT don't get the funding or the attention. We really need some dramatic improvements in order to get the investment and the move through the inertia. Even on the tactical level, what sort of benefits are some organizations that you're familiar with enjoying and getting returns on from their virtualization activities? Bennett: It really depends on whether you're looking at it from a business point of view or from an IT point of view. Gardner: Let's look at it both ways. Bennett: From an IT point of view, it's clear that they can decrease capital costs, and they can decrease operating expenditure (OPEX) costs associated with depreciation of assets by getting much better utilization of the assets they have. They can either get rid of excess equipment or, as they do modernization projects, they can acquire less infrastructure to run the environment, when they have it effectively virtualized. When they blend it with integrated management, they can manage the physical and virtual resources together and build an IT environment that really supports the dynamics of virtualization. They can lower the cost of IT operations implicitly by reducing the complexity of it and explicitly by having very standardized and simple procedures covering virtual and physical resources, which in conjunction with the other cost savings, frees up people to work on other projects and activities. Those all also contribute to reduce costs for the business, although they are secondary effects in many cases. Gardner: Do you have any examples of companies that have moved through this sufficiently that they can look back and determine a return on investment (ROI) or total cost of ownership (TCO) benefit, and what sort of metrics are we seeing in those cases? Bennett: Certainly, we are looking to do ROI types of benefits. I must confess I don't have any that are explicitly quantified, but we do have customers able to articulate some of the tangible and intangible benefits. One good example is Mitel Corporation, which went through a project of infrastructure modernization, but especially virtualization, in order to address the business needs. They had to both reduce costs and be more responsive to the business. They were able to drive about $300,000 annually out of their IT budget. That's a significant amount, because they are organized by individual business units there. I love the quote from the datacenter manager with regard to the relationship with the business, "We can now just say, yes." So it addresses that flexibility and agility type of question. If you get engaged in larger transformational projects, where virtualization is the key element, we have Alcatel-Lucent, which is expecting to reduce their IT operational cost by 25 percent from virtualization and other transformational projects. In the case of HP IT, we actually have reduced our operational costs by 50 percent, and virtualization is very much a key factor in being able to do that. It can't take full credit, of course, because it was part of a larger set of transformational projects. But, it was absolutely critical to both lowering costs, improving quality of service, improving business continuity, and especially helping the organization to be much more flexible and agile to meeting changing needs. Gardner: And, as you pointed out earlier, we are able to shift the ratio from ongoing maintenance and support costs into the ability for innovation, new systems, new approaches, investments, and productivity. Bennett: Absolutely. We see a large number of customers spending less than 30 percent of their IT budget on business priorities, and growth initiatives, and 70 percent or more on management and maintenance. With virtualization and with these broader transformational initiative, you can really flip the ratio around. HP has gone to, I think, 80-20, and I know that that's an area that Alcatel-Lucent has also focused on changing substantively. Gardner: When you say 80-20, you mean 80 percent for new initiatives? Bennett: Yes, 80 percent for new initiatives in business priorities, and 20 percent on management and maintenance. Gardner: Well, obviously HP has been rethinking virtualization. Of course, it has been rethinking infrastructure as well for some time, given its NGDC activities and some of the things that it has done internally in terms of reducing the number of data centers, and reducing the number of applications. More than that, HP has new go-to-market initiatives in its Sept. 2 announcements. Can you run through some important aspects of these announcements, and tell us which ones will help people understand the rethinking of virtualization, the strategic approach to virtualization, and also the business outcomes that they should be enjoying from virtualization? Bennett: Certainly. The first thing that I would like to highlight is that all of the products and services that we are announcing reflect the fact that we are not just encouraging customers to rethink virtualization, but that we at HP have as well. In particular, we realize that it's critically important that the products and hardware, software, and services that we provide need to embrace the virtual and the physical world together. The customers are going to be able to implement this successfully. They need the expertise. They need the products that will actually let them do it, and that's a lot of what this set of announcements in September is about. It starts with a new HP ProLiant BL495c virtualization blade, which is really designed and optimized for the virtualization environment. What we have seen impacting the ability of servers to effectively increase the number of virtual machines they can support or support growth of virtual machines is not so much CPU power as it is memory, network bandwidth, and connectivity. So, we have doubled the memory capacity of the environment, and we have increased the number of network connections that are possible on a single blade, and that will provide much more headroom for these kind of customer's environments at the infrastructure level. At the business service management level, what we are introducing is a number of enhancements to the HP software portfolio for business service management and automation. The tools that we provide in what is today the industry's leading portfolio for business service management and automation work with both physical resources for insight and control and management and governance purposes, and also with virtual resources, supporting applications and services being delivered through virtual machines provided by VMware, Citrix, or Microsoft. This is the first wave of announcements from HP software, basically building in integrated and comprehensive support for the virtual environment, as well as the physical environment. That's complemented by new services capabilities. We recognized that not everyone wants to have custom service projects, or expertise helping them with virtualization. We have some new services that are much more tactically and specifically oriented. They very clearly articulate what the outcomes of the project are, what the time frames are, and also what the costs project are. We're augmenting our capabilities. I think we are the leading platform provider for all of the key virtualization vendors out there. We are also the leading training vendor for virtualization and we are announcing new offerings in both of those portfolios -- for support and for education services around these virtual environments and virtual capabilities. Integrated support is really key. When customers experience difficulties in their data centers with a business service or application running in the environment, they don't want finger pointing across vendors. Since we are able to support the virtual machine software, as well as our operating environments, including Microsoft, and of course, the HP servers underneath them, we can provide an integrated approach to dealing with corrective issues and get them fixed on the customer's behalf. On the desktop side, we have had a portfolio of virtual desktop infrastructure (VDI) services in place already for VMware. We are announcing a new set of capabilities there for Citrix XenDesktop, both for products and for services for client virtualization. Just as important, the work we are doing in those offerings also lays the foundation for supporting Microsoft's Hyper-V when that becomes available in the marketplace as well. In addition to those capabilities, we have a new storage offering. If you look at the architecture of the data center, you clearly need to move away from direct-attached storage, and move to network shared storage. We have a new product that integrates our enterprise virtual array, which is a leading self optimizing storage solution for virtualized environments, with PolyServe NAS, which augments the virtualized environment with a clustered file system, making it easy for customers to move to a network attached or a shared storage model, as they make virtualization a more foundational technology in the data center. Then, in addition to the investments in the data center environment itself, we are announcing a new family of thin clients, some new blade workstations, which articulates the point of that, when it comes to client virtualization, it's really key to have a portfolio of desktop choices, so that customers can get the right solution on the right desktop. In many cases. it might be thin clients, but in other cases, it might be blade PCs or workstations, depending on the end user's needs. We support all of those, and we support them in different kind of environments. 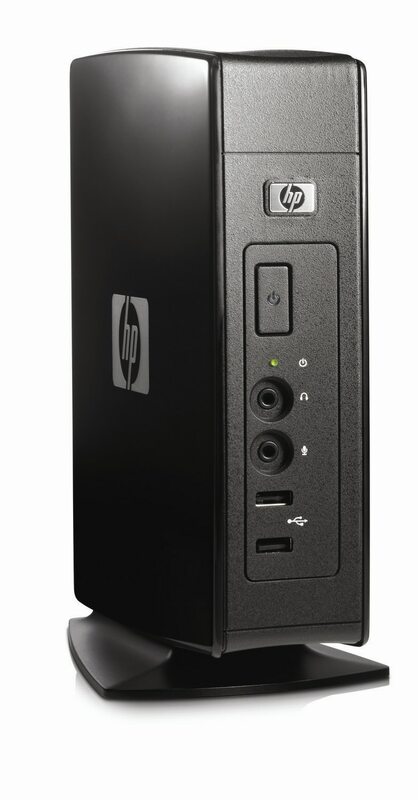 We also recognize that even if thin clients meet most of the functional needs, people sometimes still want to have either a strong multimedia or 3D performance on some of these desktops. We're announcing a new remote-graphic software offering, which will allow customers to provide a rich multimedia or 3D experience, even to a client environment not equipped with that hardware. This is the first wave, if you will, of announcements that we are making. It builds on some announcements we made last March, especially with Insight Dynamics VSE for infrastructure management, as well as the blades announcements with an Integrated Lights-Out (ILO) capabilities that we announced a year or so ago. So, we're continuing to build out this portfolio to make this real for customers, and provide the foundation for them to really exploit virtualization for their business benefits. Gardner: You mentioned VDI, and for those folks who might not be too familiar with desktop virtualization, what we are talking about is bringing back onto the servers the whole presentation of the entire desktop, not just an application or two, but the entire experience. Therefore, every time a user starts up a client device, they are actually getting a fresh new instance of the operating system, which means it could be updated, it could be patched, it could be serviced entirely without the impacting the client device. There are a number of other benefits to desktop virtualization. Is there anything I've missed in terms of those people who are just getting their feet wet around desktop virtualization? Bennett: Well, the real driver for desktop virtualization initiatives that we see are organizational concerns around management and security of the client environment. You articulated that what they get is a nice, clean desktop environment whenever they start up the PC. What you didn't say was that it's not uncommon for end users to visit sites they shouldn't have, or open mail they shouldn't have, and get their environment infected by spyware, malware, viruses or anything else. Client virtualization solutions can really give you a strong handle on management and security, and reducing the cost of both, while increasing the control of both. Also, in environments where customers have a lot of knowledge workers, one goal for corporate risk protection is the protection of end-user data that's on the desktop. In a client virtualization environment, you are able to do much better control of protecting end user data. And/or by the way, if the end users move around, either to different offices or different locations, they still have access to their data no matter where they connect from. Gardner: So, when we look at virtualization in this larger context, we're seeing that the applications can be virtualized. It's bringing everything back into a server and datacenter infrastructure, but that has a lot of benefits in terms of control, manageability, doing things on a productive level of utilization and continuity. It's almost going back to the future. Are we, in a sense, enjoying the best of the era 30 or 40 years ago around mainframes and control, with the best of the latest iterations of IT around flexibility, applications and services, Internet, and browser activities? Am I overstating it by saying we get the best of the older and the newer aspects of IT, now that we are doing this contextually? Bennett: I'm glad that you stated this as combining the best of both worlds. While the world we had 30-40 years ago with mainframes, and indeed with mini computers, was still one of the centralized control of environments that were not necessarily responsive to changing needs of the business, or individual departmental of business unit needs. That clearly is seen as a great attribute of the modern data center and modern IT environment, but it was an environment that was able to really control, manage, and secure that environment in all the areas that that managed. So, yes, we're combining the two, having the agility and flexibility that people want, having the control and discipline that people want, and also providing access to the innovation that's taking place in the outside world. We bring them the best of all these worlds, but if a customer is going to realize this, they are not going to get those benefits just by doing server virtualization projects. Gardner: So, we've seen how virtualization does have an economic benefit. It can bring control, security, and manageability back into a managed approach, a professional approach, for the IT people. At the same time, it's providing some of these business outcomes -- agility, flexibility and responsiveness -- that are so important now in a global economy, and in a fast moving marketplace. Of course, as you mentioned, this is a wave of announcements on Sept. 2, but there are much more to come in a not to distant future. Bennett: Oh, yes. You will see us continuing to do enhancements and innovation in the infrastructure, server storage, networking, and the input-output fabrics that link them all together. You will see us continuing to innovate and drive more capability and value to the people, whether it's in the support or education side, or in the project and strategy side. You will see us continuing to invest in enhancements in the software portfolio to really provide a comprehensive view of everything going on in the data center. We continue to be a leading innovator on the client side, both in the devices that sit on the desktop themselves -- whether they are standalone or client virtualization -- and with the software and tools that make client virtualization work. This is just really the first wave of what are the pretty serious investment area for HP. Gardner: And, clearly has the opportunity to accommodate a lot of the needs of IT, but still give them the opportunity to do that almost important and impossible task, which is to do more for less. Bennett: We all have that task, and the challenge is how you crack that nut. When we talked about data center transformation last spring, we introduced the concept of “Spend to Save, to Spend to Grow.” The key is finding a way to bootstrap yourself into this, and that's why we look at these things not from a fork lift perspective, because nobody is going to do that frankly, but rather what are the kind of projects you can undertake, and then link the projects together over time for transformational purposes, and also realize benefits from them. So, it becomes self-funding after a while. An example that I like to use for that is that consolidation is a best practice in data centers today. It's a way of life, but if you really want to significantly change the outcome of some consolidation, which can be substantial, it's worthwhile investing in a virtualization initiative, because when you do that you can consolidate to even less infrastructure. But before you invest in virtualization, or after you have done it, you might look at investing in an applications modernization project, because the more applications that can be virtualized, the more you can virtualize, the more you consolidate. So you get savings from the individual projects, but you're kind of multiplying the results together overtime, and that's when it gets really interesting for a customer. Gardner: So, we have these overlaps, these interdependencies that make it complex, and it needs to be thought through in a total contextual framework, but, as you say, the end result is true transformation. Bennett: Right, and the easiest way to think it through is from a business perspective. If you look at it from the bottom up, there are so many interconnections and possible paths forward that it's easy to get lost in the weeds. And, if you start popping down, you'd say, "What are the business services I am providing? What are the applications I am running for the business? What are the characteristics that we need to have in place for these, from a business perspective?" Now, what does that mean in terms of what I do in IT and what I do in the data center? It doesn't make sense to virtualize it or not. If not, carve it aside, manage it on its own. If it does, what am I going to do to effectively both implement virtualization, and manage it from a business perspective? There's a much, much smaller pool of applications business services being provided, than there are of servers and storage devices. Gardner: Well great, I think we will have to leave it there. We have been talking about rethinking virtualization and putting it in the context of business outcomes, as well as IT transformation. We have been discussing this also in the context of a number of new initiatives and announcements that HP has made, and we have been joined by John Bennett. He is the worldwide director of data center transformation solution, and the HP TSG lead for virtualization. Thank you so much, John, it was very interesting and edifying. Bennett: Thank you very much, Dana, for this opportunity. We think there is so much promise in virtualization, and we think by rethinking it in business terms, one can maximize the potential for your own organization. Gardner: Great. This is Dana Gardner, principal analyst at Interarbor Solutions. You have been listening to a BriefingsDirect podcast. Thanks and come back next time. Transcript of BriefingsDirect podcast with Hewlett-Packard's John Bennett on virtualization and its role in the enterprise. Copyright Interarbor Solutions, LLC, 2005-2008. All rights reserved.